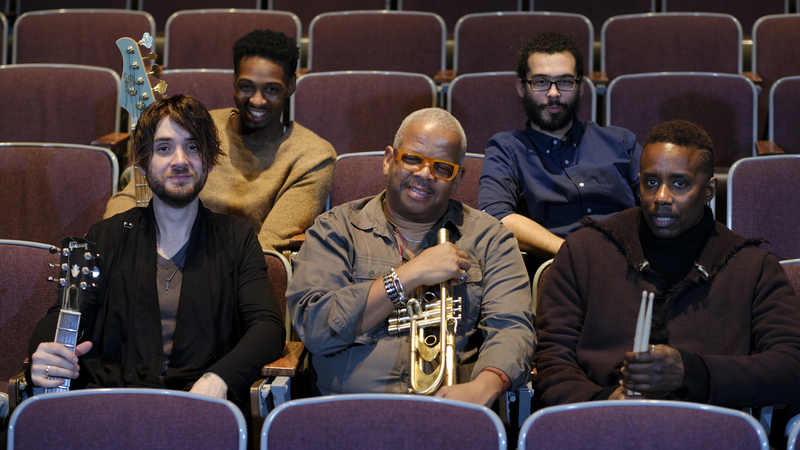 Terence Blanchard's 'Dear Jimi' Isn't Just A Tribute, It's A Healing Force Blanchard's new record LIVE focuses on black art and black lives. For this Jimi Hendrix homage, he puts down the trumpet and pitch-bends the mournful melody on synth. Terence Blanchard's new album with the E-Collective, LIVE, comes out April 20. That quality of mournful uplift also rings loud and clear on Blanchard's forthcoming album LIVE. It's a showcase for the sleek young band that he calls the E-Collective, with Charles Altura on guitar, Fabian Almazan on piano and synthesizers, David Ginyard on bass and Oscar Seaton on drums. "Dear Jimi" — which does eventually include some guitar heroics, over a vamp in the outro — is broadly in sync with the album's focus on black art and black lives. The first E-Collective album, released in 2015, was titled Breathless in honor of Eric Garner, whose death at the hands of law enforcement led to the protest slogan "I Can't Breathe." I have a vivid memory of seeing the band play this music in a Staten Island park, for an audience that included the Garner family. In similar fashion, LIVE was recorded in three communities touched by conflict between African-American citizens and law enforcement: in Minneapolis, for Philando Castile; in Cleveland, for 12-year-old Tamir Rice; in Dallas, where police officers Lorne Ahrens, Michael Krol, Michael Smith, Brent Thompson and Patricio Zamarripa were killed while marching with Black Lives Matter activists. The album's track list includes some pieces with a pointed message — like "Unchanged," a haunting ballad by Altura, and "Soldiers," which opens with interpolated vocal samples of Malcolm X and Martin Luther King, Jr.
Blanchard has recently had success with more formal expressions of artistic intent: five years ago he unveiled Champion, an opera inspired by the story of gay welterweight boxer Emile Griffith. He is now working on another opera, Fire Shut Up In My Bones, which is based on the memoir of New York Times columnist Charles Blow, and has a scheduled premiere next year. By design, the E-Collective works closer to ground level. In a statement provided by Blue Note, Blanchard put it this way: "I wanted the music to be a healing force in the areas in which we performed — to let the music take your anger and frustrations. I'm not telling people not to be angry but when things become too much, the music is there to help you heal." LIVE is out April 20 via Blue Note Records.